Bike Bikes, Big Benefit for Charity! 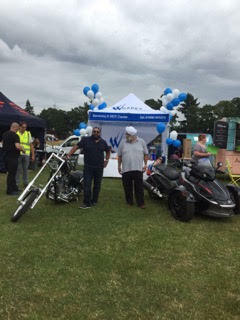 As summer ends we reflect on one of our best events this year, the West Byfleet summer fayre 2016. We pulled out all the stops, we had so much fun and to-date we’ve raised over £1000 for the Royal Marsden Hospital. Great to see some of our long standing clients, as well as having the opportunity to introduce WCarey Motor Engineers to the wider Woking community. We’re a family managed garage and we welcomed the chance to have fun with our clients and neighbours. Our two choppers pulled in the crowds: restored to their former glory by our team of mechanical engineers, we were excited to show them off. But there was also a more serious side to the events. A future where cancer is no longer a threat to human life young and old is something we are incredibly passionate about. The Royal Marsden Hospital is an international cancer research centre working hard to save lives, their compassion, dedication and absolute focus on finding the best treatment is amazing. That is why we take every opportunity to raise money to help support their work, especially the work they do for children. And the summer fayre was a great opportunity to continue our support. Big thanks to everyone for joining in the fun, we’re planning a few more events to raise even more money to help our favourite charity and we’re already thinking about how we’re going to make next year’s summer fayre bigger and better. Safety problems can pop up unexpectedly, no matter how many miles you’ve clocked. Put your mind at ease and get a free safety check today. Our motor engineers frequently attend training courses to keep up-to-date with the latest techniques and technology. From the condition of your tyres including your spare wheel to your catalytic converter, you can be sure that when we check your vehicle we leave nothing uncovered. For over 40 years, hundreds of people in Woking, West Byfleet, and the surrounding areas have chosen W.Carey Motor Engineers to service and MOT their vehicles. We are conveniently located in West Byfleet. For our regular service’s we also offer free collection and delivery. Book your FREE vehicle safety check appointment today!